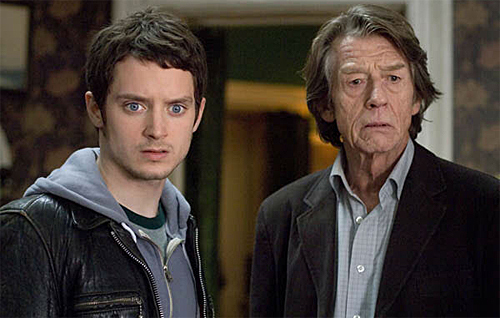 Martin (Elijah Wood), an American, moves to England with the hope of working with Arthur Seldom (John Hurt), a renowned professor in mathematics. Martin is so obsessed with the idea of Seldom being his advisor that the house he chooses to live in is owned by none other than Seldom’s longtime friend. But when the landlady (Anna Massey) ends up dead, Inspector Petersen (Jim Carter) suspects that the killer is someone the deceased knew. Based on a novel by Guillermo Martinez and directed by Álex de la Iglesia, “The Oxford Murders” embraces an in-depth dialogue about math, symbols, and logic to the point where it becomes stifling. Couple it with characters of paper-thin motivations but are treated by the screenplay as fully functioning individuals, its universe is repellent and unconvincing. Martin is brilliant but he does not hide behind an intellectual facade in order to be respected. It is easy to root for him because, unlike personalities he meets along the way, he is likable. But the screenplay makes one glaring mistake: in its attempt to complicate for the sake of complication, it makes Martin a suspect. This is most unnecessary because everyone else is already a suspect. There is Beth (Julie Cox), the landlady’s daughter, who falls for Martin minutes upon their first meeting, Lorna (Leonor Watling), a nurse who knows more than she lets on, and Yuri (Burn Gorman), a fellow mathematician who shares an office with Martin. Take a labyrinthine mystery and a bunch of untrustworthy characters, you get a confused audience. Since I did not know who to trust in terms of my own hypotheses regarding the identity (or identities) of the killer, ultimately, I found myself not caring. Furthermore, there is a handful of scenes that beg to be reshot. Sometimes it feels like we are watching an audition tape rather than a final cut because of the way some lines are delivered. For instance, when Beth allows her feelings to be out in the open, only to be shut down by Martin, she storms out of the room while Martin yells, “Don’t go!” The way the scene is set up and the insincerity of the supposedly dramatic line are so laughably bad that the scene holds neither tension nor an air of seriousness. It feels like a waste of film and time. In addition, Cox is either miscast or not given enough direction to prevent her character from appearing obvious and fake. Cox is good at delivering extremes, like coming off as very insecure to the point of craziness, but Wood is more about playing what simmers just below the surface. Since the actors are rarely on the same wavelength, they share no chemistry. Still, there is a reward at the end of the tunnel. The way everything is explained is appropriately logical and clear. But the journey there is like pulling teeth because I could not help but feel like I was being tricked with all the red herrings in the atmosphere. Based on the screenplay by Álex de la Iglesia and Jorge Guerricaechevarría, “The Oxford Murders” is ambitious but it collapses on itself because not only is it uncompromisingly pedantic, its lack of focus on technical details push us out of the experience. Watching it is like listening to someone so smart but that person radiates no charm: in one ear, out the other. I’ve had this movie in my queue for such a long time. Good review. I think I will finally give it a go. Thanks!